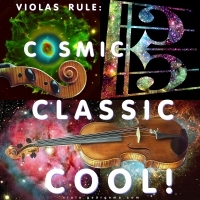 “Violas Rule – Cosmic – Classic – Cool!” is the text, as viola and alto clef images float above a galactic backdrop of colorful nebulae! A great design for violists who like space-age imagery. Buy this design now on any t-shirt or apparel item, tote bag, mousepad, mug or other quality giftware item exclusively from Bratsche’s Viola Bazaar!